Constance Le Prince Maurice - Stay Longer Summer Offer 2019; Pay 7 Stay 9 ! The Barceló Bávaro Beach - Adults Only ***** hotel is located on one of the 10 best beaches in the world, in Punta Cana, Dominican Republic. This hotel has reinvented itself after a complete renovation to become an exclusive hotel for adults only. The hotel offers first class rooms 80% of which are located on the beachfront – providing a most perfect place for a romantic getaway. Enjoy the excellent cuisine this hotel offers with its Barceló All Inclusive program and its Caribe Buffet, Chez Gourmet and La Brisa Restaurants, as well as its facilities with options to fill your day: football pitch, tennis courts, swimming pool, golf course, water sports, wellness center (Spa), theater, casino and more. Barcelo Bavaro offers up resort credits so you can enjoy even more leisure and hospitality options. Up to 4 nights: US$1,200 in credits. From 5 to 11 nights: US$2,000. 12 nights or more: US$3,000 in credits! 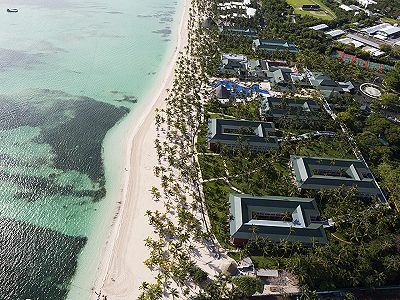 Staying at this hotel also grants guests access to the facilities of the Barceló Bávaro Palace Deluxe, a hotel which shares some of its services and facilities. This property is one of the few in this country that has international BLUE FLAG recognition for its adherence to standards outlined by the non-profit NGO, Foundation for Environmental Education (FEE). Enjoy 3 restaurants & 2 bars at Barcelo Bavaro Beach (Caribe Buffet Restaurant, La Brisa & Chez Gourmet restaurant and Bar Mamey & Bohio Chill Out Bar). Guests at Barcelo Bavaro Beach may also dine at Barceló Bávaro Palace Deluxe: Miramar and Bohío Dominicano restaurants; El Coral, Santa Fe Steak House, México Lindo, La Fuente and la Dolce Vita a-la-carte restaurants. · Towel, sunlounger and palm leaf parasol service on the beach and swimming pool area. · Non-motor water sports (kayaks, pedal boats, snorkeling, wind sailing, water polo & sailing boats). · Free land sports (tennis, sports tracks, table tennis & mini golf) Daytime miniature golf. Golf packages at Barcelo Bavaro Beach feature Unlimited Golf at The Lakes Golf Course. FREE Resort Credits on check-in may be used to reduce Cart fees payable. Listed Package Prices: Listed golf package prices apply with Unlimited Golf. Superior Room (47 m²) King size bed or two doubles; fan, terrace or balcony, air conditioning, 32” LCD TV, Wi-Fi ($), closet with iron and ironing board, coffee maker, safe, minibar, hairdryer, magnifying mirror, bathrobes, slippers. Maximum capacity per room 4 adults, using the existing beds. Superior Room Frontal Ocean View (47 m²) with sea views. King size bed or two doubles; fan, terrace or balcony, air conditioning, 32” LCD TV, Wi-Fi ($), closet with iron and ironing board, coffee maker, safe, minibar, hairdryer, magnifying mirror, bathrobes, slippers. Maximum capacity per room 4 adults, using the existing beds. Superior Room Ocean Front - Club Premium Rooms with sea views. A bedroom with a King size bed or two doubles; terrace with private garden or balcony, air conditioning and fan, minibar, 42” LCD TV, Wi-Fi, coffee maker, iron and ironing board. Fully equipped bathroom with hairdryer, magnifying mirror, slippers and bathrobes. Exclusive Premium Club Service and amenities and service. Maximum capacity per room 4 adults, using the existing beds. Master Suite “Club Premium” Rooms measuring 94 m². A bedroom with a King size bed and a very comfortable, separate living area. 2 42” LCD TVs, Wi-Fi, 2 fully equipped bathrooms with hairdryer, magnifying mirror, bathrobes and slippers. Two closets with iron and ironing board; fan, air conditioning, coffee maker, safe, 2 minibars, microwave oven and Jacuzzi. Exclusive Premium Club Service and amenities and service. Maximum capacity 2 adults per room. Caribe buffet restaurant Indulge in marvellous, varied flavours at this buffet of international foods, offered to you in a refined, unique setting. Casual dress code. La Brisa Get comfortable in the perfect setting offered by a combination of exquisite food and the restaurant's remarkable views - situated right in front of the sea. Specialised buffet lunch with international cuisine. A-la-carte evening dinner specialising in Mediterranean Gourmet cuisine, from 19.00 to 23.00. Chez Gourmet Fall in love with the delicate elegance of our a-la-carte restaurant that specialises in international cuisine, tastefully designed for enjoying a magical evening over a delicious dinner, which is served from 18.00 to 23.00. Formal dress code. Prior reservation required by calling customer services. Bar Mamey (Lobby bar) A completely new and picturesque bar strategically located in the main lobby. Just a few metres away you can admire the beautiful scenery blending in with the lobby's environment. Barcelo Beach guests enjoy a large central outdoor swimming pool. Also, as an addition, you can enjoy the fabulous pools located at the hotel Barceló Bávaro Palace Deluxe, one just for adults and another semi-Olympic. In the pool area there are all types of entertainment, with pool beds, water jets and a lot more. • Professional soccer field of 100 x 55 m.
• Semi-professional baseball field 60 x 60 m.
Open 24 hours. Have fun with American roulettes, black jack, Caribbean poker or Texas hold'em. In addition, if you contact the casino staff you can organize a game of Texas hold'em with your friends. Enjoy the most spectacular theatre of the Caribbean with a capacity for up to 1,400 guests and incredible décor inspired by Las Vegas with 2 levels of entertainment for you to enjoy, a bar on each level and a waitress service so that you do not miss any of the fabulous show. Thoroughly enjoy the excellent staging of our dancers and live music for the best band. A different and unique show every night. Redesigned in 2010 by the internationally renowned architect P.B. Dye, this championship golf course crosses a lush mangrove forest, has 25 lakes which surround and protect it and 122 strategically placed bunkers. The design cleverly makes the most of the natural beauty of the Bávaro area by incorporating native plants and species around its meticulously manicured greens and fairways, ensuring the best playing surface and the highest standards the industry offers. Holiday Bookings to be received no later than 7 days before travel. Holidays crossing date bands listed above will be priced on a Pro-Rata basis. All Prices listed are subject to availability at the time of Booking. Please await confirmation of your reservation before completing flight arrangements. A deposit of 20% is payable for bookings made more than 4 months in advance, with the balance payable 45 days before travel. Requests to change confirmed holidays should be notified by the Party Leader to Ascot Golf in writing. Ascot Golf arranges car rental and transfers at all our of Golf Holiday destinations. Please ask for a Car Rental quote with your Holiday enquiry or reservation.